Termites Infesting or Do You Have an Ant Problem? It is difficult to tell the difference between a swarm of carpenter ants and a swarm of termites. Termites have a rectangular body without any constriction. The termite’s antennae’s are straight and beaded. If you take a closer look then you can find that the termite has four wings of equal size and shape. Their wings fall off easily and you can find a lot of them near any termite nesting site. Their wings are longer than their body too. Ants have a narrow, constricted waist and their antenna is elbowed. An ant also has four wings and the fore wings are longer than their hind wings. Termites feed on wood and they create a nest in the wood they feed. Carpenter ant does not eat the wood, they only dig wood to excavate their nest. The tunnels and galleries created by the carpenter ants are smooth and well finished and they will push small piles of wood shavings through the holes of the wood. Carpenter ants only target damaged and moist wood to excavate their nests because their teeth are only designed for that. Termite galleries are rough and ragged and almost every galleries created by termites are filled with layers of soil and mud. Termites will chew right into any thick wood or furniture. A peculiar feature of termites is that they built tubes between the soil and wood. Termites move through these mud tubes. Termites and ants generally reproduce in the spring time and you can control the ant’s population growth by using ant bait like Terro at the site of their swarm, but in the case of termites it is difficult. A trusted professional knows how to effectively eliminate termites forever from your property. A Termite company can effectively carry out post construction or pre-construction termite treatment for your residential and commercial establishments. 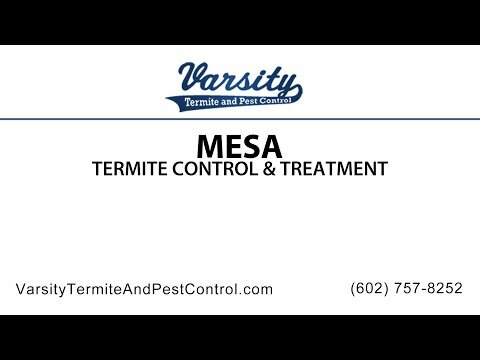 The best termite companies in Arizona like Varsity Termite and Pest Control, conform to ISI standards for safety and the products and treatments they use are environment friendly. Most Termite treatment companies offer free inspection and the inspector entrusted with the inspection of the property will go through all the vulnerabilities in your property and suggest necessary changes. The inspector will outline a solid preventative plan for your property. He/she also describes the entire process of treatment in detail, so that you will have no doubt about it in the future. A feature that Varsity Termite offers is a home warranty protection plan. Get the peace of mind knowing that you will never have termites and the damage that comes with it again. If you do, Varsity will happily take the responsibility. So give us a call today for more information about termites or ants as a professional will gladly help you to the best ability they can!